Left: Carmel’s Victor Satlov rises to fire a jump shot in Monday’s win over Brewster. 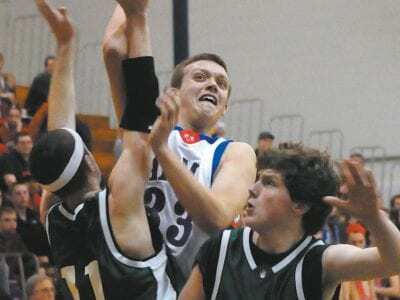 Above: Mike Rooney delivered a season-high 27 points to spark PEARLMAN the Rams. CARMEL—A sizzling hot Mike Rooney poured in a season-high 27 poin… Please login below or purchase a subscription to the Putnam County Courier to access this content. Brewster’s Ricardo Lopez controls Andrew Grella of Beacon on way to a pin against Beacon last week. BREWSTER—The Brewster High wrestling team took down Beacon last week in a League 1-A match, 44-31, but the Bears went into a tough dual me… Please login below or purchase a subscription to the Putnam County Courier to access this content. MAHOPAC—Those from the area who follow high school wrestling know that the Indians have had success as a team this year, and some of its members are not to be reckoned with in their respective weight classes. But after last weekend, there are … Please login below or purchase a subscription to the Putnam County Courier to access this content. Steven Mazzerisi floats to the hoop in recent action. Mazzerisi had 10 points in a loss to Ossining last week. 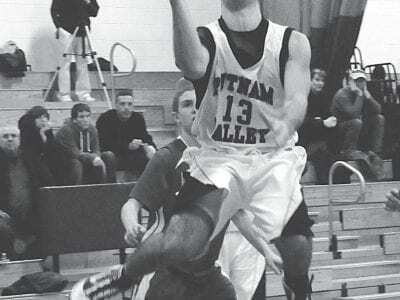 PUTNAM VALLEY—The Putnam Valley High boys basketball team lost a non-league game Monday to Eastchester, 57-30. On Friday Put Valley l… Please login below or purchase a subscription to the Putnam County Courier to access this content. SOMERS—Matt Schoen dropped in 22 points and grabbed five rebounds to lead the Kennedy Catholic High boys basketball team to a 63-49 victory over Lincoln Hall in a league game played last Wednesday at Kennedy High School. Kennedy led 14… Please login below or purchase a subscription to the Putnam County Courier to access this content. BREWSTER—Despite two strong periods to close out the game, the Brewster High ice hockey team wasn’t able to overcome an early three-goal deficit against league opponent Pawling last week, ultimately losing 5-2. The loss dropped Brewster … Please login below or purchase a subscription to the Putnam County Courier to access this content. MAHOPAC—The Mahopac High boys basketball team capped off a good week by defeating rival Carmel, 62-50, at home in a League C game on Saturday. That win came one day after defeating Lakeland on the road, 72-63, in overtime in another le… Please login below or purchase a subscription to the Putnam County Courier to access this content. 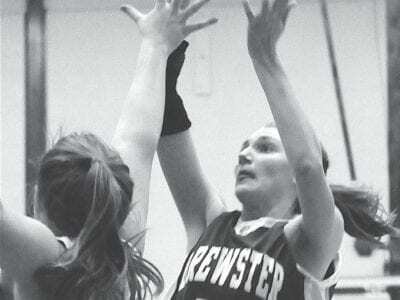 Brewster’s Lauren Quattrocchi led the Bears with 21 points in a win over Panas. BREWSTER—The Brewster High girls basketball team worked on staying sharp last week, and the Bears did not get caught up in playing to the level of their oppon… Please login below or purchase a subscription to the Putnam County Courier to access this content. 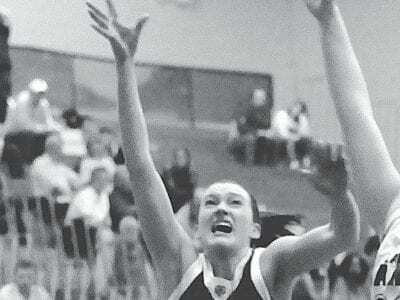 Brewster’s Emily Tapio BREWSTER—Brewster High girls basketball standout Emily Tapio has verbally committed to attend Fordham University on a full basketball scholarship next fall. Tapio, a senior guard/forward, has played on the Brewste… Please login below or purchase a subscription to the Putnam County Courier to access this content.